Perhaps this is truer than people are willing to recognize? This post is a continuation of an earlier one, “The Unparalleled Power of Patriotism (Part 1).” Read it first! Looking at patriotism in this way, it’s easy to see how things can get carried away. The sense that the loss of an American life is more devastating than the loss of an Iraqi’s or any other person’s life instills Americans with a dangerous sense of superiority, of an almost racist nature. Not only can this give Americans too much of a “proud to be an American” sense, it inherently devalues any who aren’t American! Using patriotism for war? Perhaps you have forgotten about 9/11!! Remember? When war was declared on the U.S.? We are defending America and fighting the global war on terror. 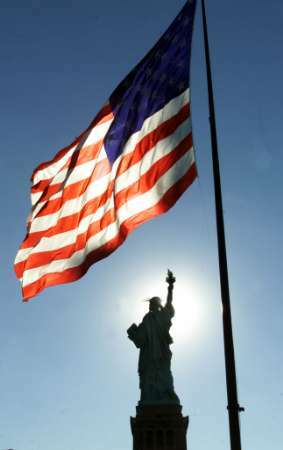 Patriotism is standing by America…recite the words of the National Anthem and remember 9/11. Do this and you will understand. Now, maybe I’m just blind or stupid, but it seems like this response is exactly what Josh Ondich is warning of. Besides that, Pamela Reece’s “comeback” argument illustrates perfectly the kind of fanatical, almost mindless patriotism that many Americans use to justify all kinds of evil. The line, “Patriotism is standing by America… recite the words of the National Anthem and remember 9/11. Do this and you will understand,” is particularly appalling. To me, the advice to recite our National Anthem and remember 9/11 is reminiscent of Soviet-style nationalism or the advice some Christians give: “Just pray to Jesus and you’ll understand the truth!” It shows a terrifying immaturity of thought and a dangerous unwillingness to listen to any kind of disagreement, insisting that a “good American” doesn’t ask questions and doesn’t need answers. Perhaps more infuriating though, is a “tribute” on the left side of the page, a slideshow with images of 9/11 and the bombing of the USS Cole, which then transitions to the words “Never Forget Who Did It,” which is followed by pictures of Middle Eastern men. This victim mentality was used by George Bush to embroil the US in two devastating wars, and is still the opinion of many conservatives (particularly evangelical Christians) in the United States. As Gandhi said, “An eye for an eye leaves the whole world blind.” I can think of few things that are more blinding than such an insistence on national superiority. Patriotism is good when it’s used to express valid pride in country and culture. But it, perhaps more than any other sentiment, can become poisonous extremely quickly. 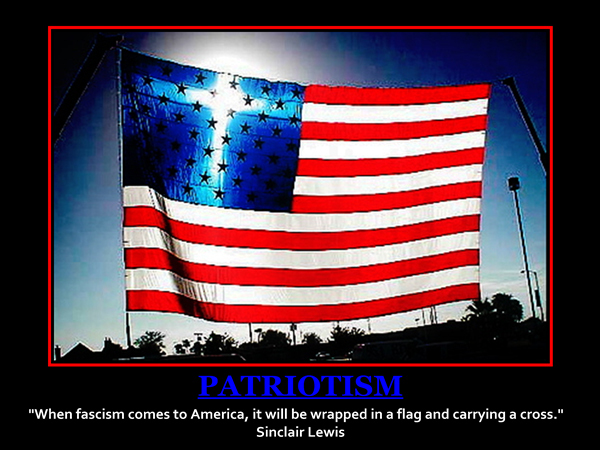 As soon as patriotism is turned into a justification or reasoning for war, torture, or other such crimes against humanity, it can become nationalist, McCarthyistic fervor, which is no better than the religious fanaticism American patriotism is so often turned against. How far can patriotism go before it becomes dangerous nationalism? Ever since the idea of a nation emerged not more than a few hundred years ago, nationality has become an integral part of who we as humans consider ourselves to be. When we come across someone with an unfamiliar accent or language, our first question for them is often “Where are you from?” The first words we typically use to associate someone with a group of people are those that tell which country they come from, rather than those that reinforce their humanity. Our nationality has become one of the most prominent features of our identity. The point I’m trying to make is that nationality has become a very important part of who people consider themselves to be. The word usually used to describe pride in one’s country, culture, or national heritage is patriotism. Patriotism has always been popular in America, especially as the country was still nascent during the rise of nineteenth-century nationalism. Back at its founding, America was, as many like to say, a “melting pot” of a broad spectrum of people with varying beliefs and ideals. Unlike other, older nations, America was a nation that was deliberately created by its inhabitants, rather than slowly coalescing into gradually more central power, as most European nations did. It was out of this sense of unity that an almost fanatical nationalism began to rise. After enduring and recovering from such a heinous attack, Americans’ sense of patriotism rose sharply, as songs like “God Bless the USA” came strongly back into vogue and politicians at all levels began employing forceful rhetoric about national unity and strength as a nation. Now, please don’t get me wrong with this; I think that the unity and solidarity that Americans felt in the aftermath of 9/11 was incredible, and helped bring hope and restoration to the loved ones of those who died. But it also conjured up a dangerous “us versus them” mindset that allowed President Bush to declare a more-or-less unilateral “War on Terror,” a war that has not only cost thousands of lives and billions of dollars, but has also tragically heightened anti-Muslim sentiment in the United States. Of course, nationalism can be seen in myriad other places and situations as well. In talking to some American friends and acquaintances, I’ve seen a tragic sense of national superiority in what they say. For example, American citizens are quick to mourn the more than 4,000 deaths incurred by US Armed Forces in Iraq. I won’t deny the tragedy of this bloodshed, but far fewer Americans show such outrage at the more than 100,000 civilian deaths that have so far come about in the conflict. Many Americans I know seem to feel that they’re simply worth more than others. I’m going to break this article up into two parts, as I’ve realized it’s getting much longer than I had originally thought! Expect the next post soon!